Sometimes it can take a while to be able to talk about a traumatic experience and the delay in providing this review is one of those occasions. In a bid to boost the number of clubs in our football pie league (the Pieremiership) I made the trek from my home in Gloucester over to Luton for the top of the table clash with Wycombe on a Tuesday night in February. Despite arriving in Luton quite early I delayed going into the stadium which is an absolute school boy error when it comes to pie reviewing. Getting in early you should get the best choice of pies and they are less likely to have dehydrated in the hot locker. The reason for my delay is that I am a minor public transport geek these days. Luton has a bus on rails (busway) which I wanted to see. (Yes, such a thing does exist!) I enjoyed my trip on the busway and I can't really explain why. I know that I am so far from cool that I am probably contributing to melting of the polar ice caps, but I don't care! In this case my trip on the busway wasn't worth it. Although I was still about 15 minutes before kick-off the away end was packed. All the Wycombe tickets had sold out because this was a tasty top of the table clash. But the food wasn't tasty. In fact it didn't really taste of anything, the food kiosk having completely sold out of hot food. This was very worrying, especially as I had arrived hungry! They pointed me in the direction of the bar which might have more food. I desperately hoped they would have something, having come all this way, to go home pie-less would have been heartbreaking. My spirits lifted when I eventually got into the crowded bar and saw what looked like a pie in the hot locker. 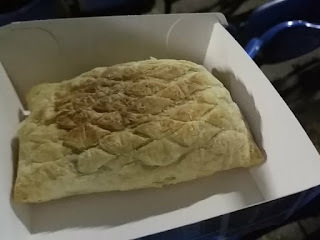 They told me it was cheese and onion, really not my favourite but I wasn't going to be fussy as it was apparently the last pie available in the whole ground and they weren't going to get any more (or any other hot food), even at half-time! This seemed like a bizarre situation to be missing out on much needed revenue. I wondered whether there was perhaps some food in the home end and away fans were being treated worse (again). Anyway, back to the pie. To be fair they did warn me it wasn't in a great condition (which is why it was left til last). But what they hadn't warned me about was that it wasn't actually a pie! Absolute disaster! It took the form of something I would describe as a 'slice' as sold en masse by companies such as Ginsters. Unfortunately this was not the first time that I have ended up with a slice instead of a pie and I have developed a bit of a reputation on the Pierate Ship! In my defence this has mainly been down to lack of clear advertising, although I don't think this excuse will wash with the rest of the crew. If you are familiar with Pierate you will know that this doesn't meet our definition of a pie because it doesn't have a lid. Therefore we are unable to give it a score, which is perhaps a let off for Luton because this was one of the worst products I have had the misfortune to come across whilst sailing the 7 Cs. But you might be wondering why this was so bad. 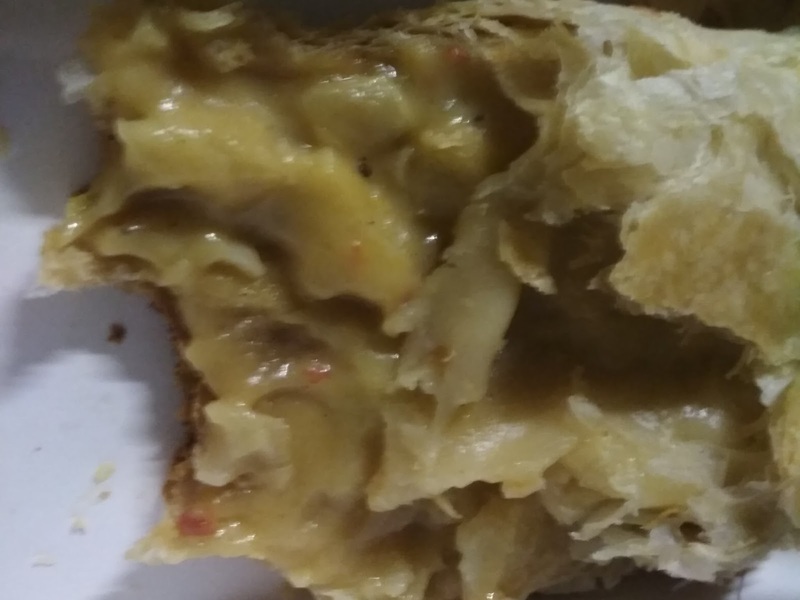 Not only was this not a pie, it was also the most disgusting pastry product I have had the misfortune to eat at a football ground. Even worse than the ASDA smart price pie I was sold at Cheltenham. I like the occasional bit of puff pastry but this was so dry and flakey it disintegrated to nothing. 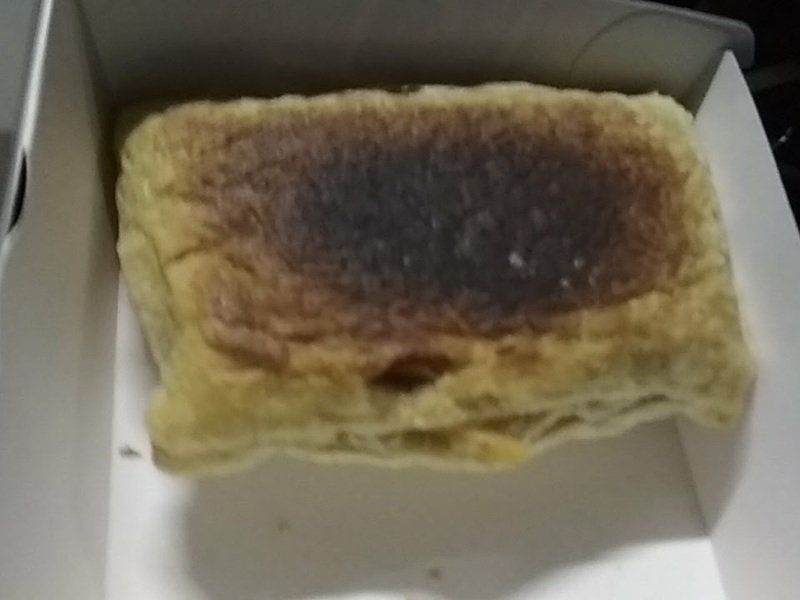 Then there was the burnt bottom which was practically inedible. But this wasn't the worst bit about this pie. The filling was absolutely vile. I have to admit, I don't often go for a Cheese & Onion pie, but I have had some that I liked as long as the right cheese is used. But this one was just full of liquid cheese the type of which you might find in a burger. I tend to refer to this as 'plastic cheese' and I am not convinced it is actually made of cheese at all. That said, I am quite happy to eat a little bit on a burger, BUT NOT THE WHOLE CONTENT OF A PIE! Who ever thought this congealed mess of cheesiness was a good idea? The soft onion provided some respite but was also a bit overpowering. There was nothing to get your teeth into at all with this pie. It felt like eating a soggy bag of cheese & onion crisps. Overall, you might gather than I wasn't impressed. But rather than not enter Luton into our the Pierate Football Pie League (The Pieremiership) I have decided to enter them on zero points, given that they failed completely with their pie delivery. Not entering them feels like letting them off the hook. Hopefully this will act as a warning to others who might think about going to a match at Luton! This slice was advertised as a Pukka. I didn't want to believe it but having reviewed photos it looks identical to what they have called a Cheese & Onion 'pasty'. Clearly it is not a pasty either, I really think Pukka need to work on their understanding of different pastry products, a shame when they are one of the biggest pie producers in the country!